Wrigley and the Cubs: What Do Wrigley and the last Emperor of China Have in Common? What Do Wrigley and the last Emperor of China Have in Common? 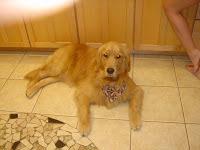 Today is day two of our latest ordeal with Wrigley, our 16 month old golden retriever. (My husband caught him chewing a plastic razor from a bathroom trash can and the sharp razor part had already been swallowed). He is showing no signs of pain or discomfort but remember that this is the same dog that runs directly into stucco walls in the backyard without even a whimper. He's had a steady diet of breads and rice that hopefully have coated the sharp edges of the razor as it slips through his 80-pound body. And although it's one of the most unpleasant things I do all day, I am checking his #2 droppings similar to how the servant/workers checked the bowel movements for the last Emperor of China. Don't you remember in the movie, they checked to see the color of his urine and the consistency of his poos and adjust his menu to "fix" or correct any problems? Here's the clip for the movie in case you forgotten it (the movie came out 10 years ago, so maybe you weren't even going to movies yet). The child actor was so adorable, but his life was pretty sad overall. ..........Scary for me and the family, but Wrigley is oblivious. He's happy all the time. 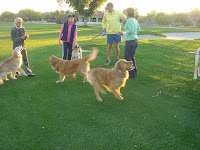 Every night, we head out to the golf course (we call it our dog park, FYI) and he runs for tennis balls, tackles his buddies and occasionally tromps through the sand traps (shhh! don't tell anyone). Keep your fingers crossed that maybe tonight the razor will reveal itself and Wrigley is fine! Maybe he spit out the razor and hid it like they hide their bones! Good luck on your search & hope you find it soon so you know all's well (& you can cease the intense poop examination)! Yes, we once had a *trasher* that was actually the best dog we ever had, aside from this annoying habit. She was a Cairn Terrier & the love of our lives, but she had that quirk. We discovered our son had hidden a bag of marijuana under his bed, when poor Lulu ate it. How do you scold a stoned dog? I was just thankful that she lived. And my son learned a good lesson. For about a week. But, maybe June is right. Aren't sweet, not-so-bright dogs protected by unseen forces or something?